A while back I wrote a blog post about our favorite sauce in the whole world, Bitchin’ Sauce made right here in Carlsbad. We eat it so often that I decided to try to recreate it at home rather than continue paying $4 per container. I googled for ideas on almond based sauces and was thrilled to find that someone else had already recreated the sauce! Thank you Fauxmartha! Fauxmartha’s Bitchin’ Sauce recipe is for the original style sauce and we like the chipotle best so I still need to experiment to get the right flavor/heat but I can find lots of things to do with the regular stuff! Prepare sauce (see recipe below). Preheat oven to 375 degrees. Cut potatoes into large cubes. Place in large pot of cold water, heat and boil for 10 minutes or until soft but not mushy. Drain and reserve liquid. Place tomatoes in a bowl and pour the boiling potato water on the tomatoes and let sit for several minutes so the skins will peel off easily. Remove tomato skins. Put potatoes and tomatoes in greased casserole dish. 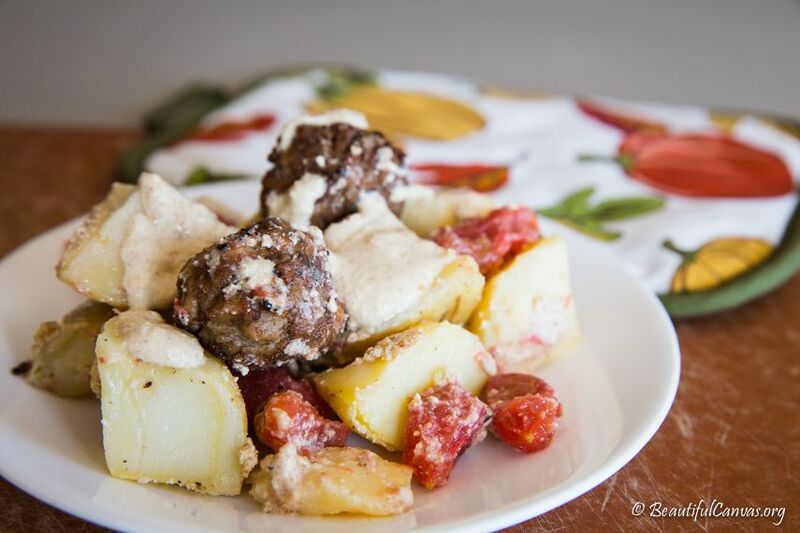 Put meatballs on top of potatoes and tomatoes. Spoon sauce on top (my best guess is that I used 6 or 7 spoonfuls). Generously salt and pepper. Bake for 30 minutes or until meatballs are heated through.